We couldn’t resist running this photo. That’s Barbie on the left, Josh in the center. Upon arriving at this event, on this beautiful sunny day, I ordered a lighter, easy drinking Marble Pilsner. I usually order an IPA, but wanted to keep an open mind and a clean palate. Before the event started I took some time out to talk to Barbie Gonzalez, Marble’s Director of Taproom Operations, about the event. She was excited about this being the second year for this event and was looking forward to hosting it at the Westside location. Barbie and the rest of the crew at Marble were very helpful and informative throughout the event. Luckily a friend from the ABQ Craft Drinker’s group, Ken, was also there and I had a second brain to an set of taste buds to tackle this delicious event. All the goodness on one tray. The first pairing was Marble’s Rauchbier with the Jasper Hills Landaff Holstein. The smokiness of this brew matched perfectly with this tangy, buttery cheese. It was a great first impression of the tasting. The second offering was Marble’s hoppier Maibock with the Uniekaas Truffle Gouda. I personally was not a fan of this cheese. The balance was good, but personal taste kept me from making a good comparison. I feel a bit unsophisticated not liking this cheese with its rare Italian truffle shavings. The Maibock matched well, but couldn’t win my taste buds over to the cheese. The next pairing was one of my favorite brews from Marble, the Double White, a hazy Belgian-style wheat paired with a UK cheese called Wensleydale with cranberries. The cheese was sweet, lightly flavored and the type you could spread on crackers until you felt much regret at the end of a movie. Loved the beer and the cheese, it was definitely a fun match. 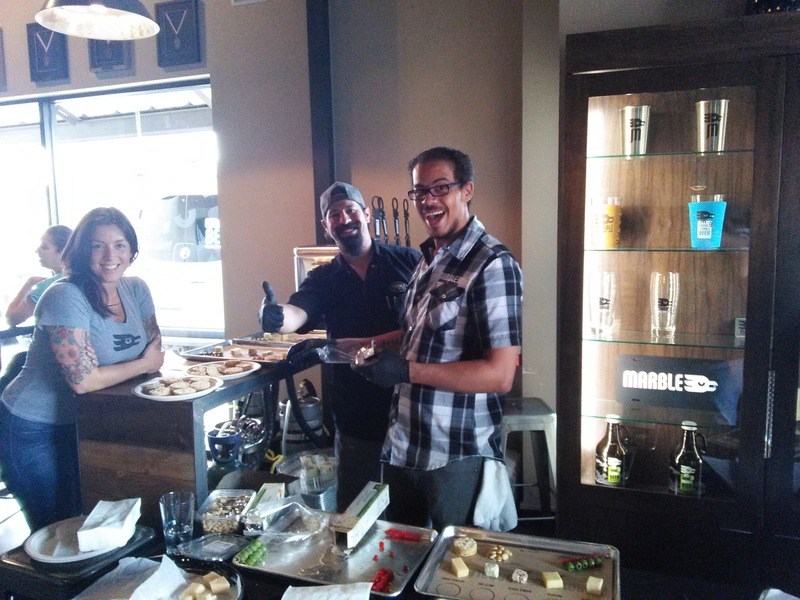 The fourth pairing, Brett IPA and Igor Gorgonzola, was also a matter of taste. If you love the awesome funkiness of the Brettanomyces and the similar earthy flavor of the Gorgonzola Italian Blue Cheese, then this is the match for you. Unfortunately, this was not the match for me or my tasting buddy, Ken. He noted that the sourness of the Peruvian sweet peppers brought more of the sour out of this beer and this was more to our liking. Finally, last but not least, was the Oatmeal Stout and the Piave Vecchio, another Italian cheese. This intense, sharp, dry, Parmesan cheese matched perfectly with the stout. 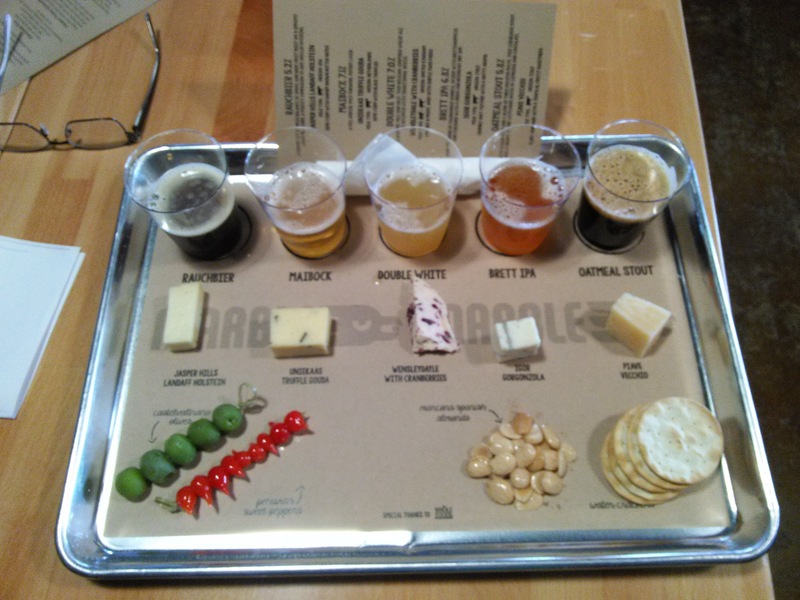 If you haven’t been to a Cheese and Beer pairing, you should check out this palate adventure. It is fun to listen to the buzz from the other tables as well and find out exactly how different everyone’s tastes are. I heard much praise on the gorgonzola/Maibock pairing and I couldn’t even finish that combo. The fun part of craft beer and food pairings are that they are as different as the people who are trying them. Le Chat Lunatique, one of our favorite local bands. 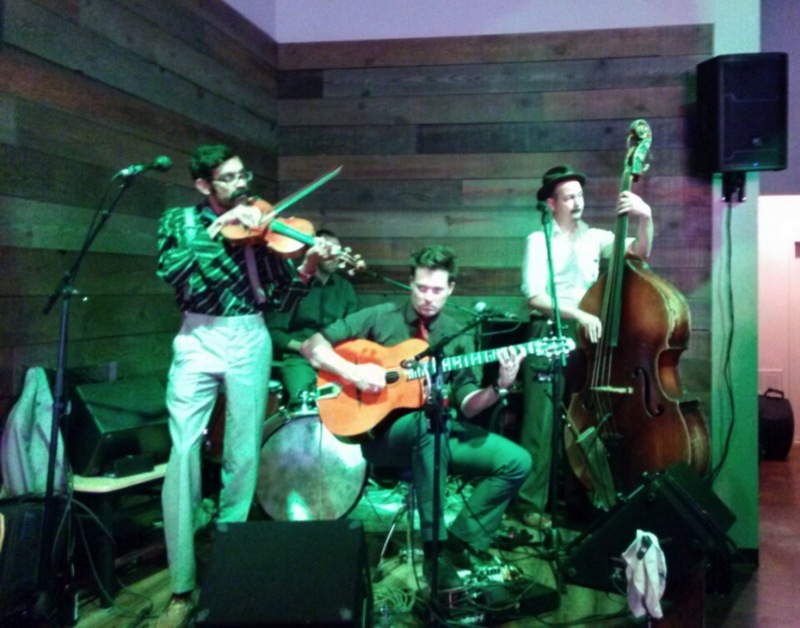 I cannot end this little write up without mentioning the the gypsy Jazz band, Le Chat Lunatique. Beautiful blend of old and new Jazz music, Swing, Rock and Reggae. Marble outdid themselves with this fun event with the comfortable atmosphere, great service and wonderful music. Cheers to the Marble Crew!